RAPID CITY, S.D. 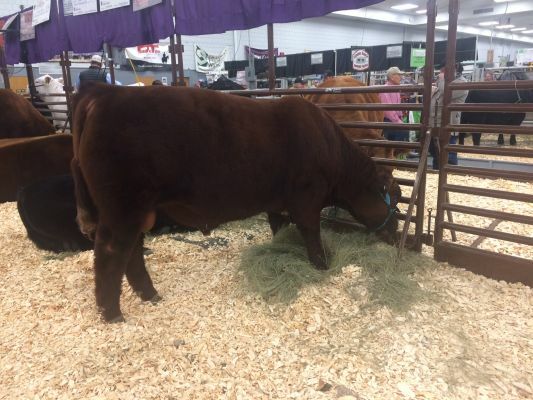 - The Red Angus, Gelbvieh and Shorthorn cattle sales were held Thursday at the Black Hills Stock Show. In the Red Angus sale, 36 bulls sold for a total of $118,200. The top selling bull was RED BLAIR'S SIGNAL 850E and sold for $7,500. In the Red Angus heifer sale, four bred heifers sold for $30,050. The top selling bred heifer was WEBR EXPECTATION 7104 and sold for $16,000. Eighteen yearling heifers sold for $48,850 with the top selling yearling heifer selling for $6,000. In the Gelbvieh sale,14 bulls sold $71,000. Top selling bull was BEA 803F ET, which sold for $8,750. Six yearling heifers sold for $12,200 with the top selling heifer fetching $2,500. One bred heifer sold for $4,750.00. And in the Shorthorn sale, thirteen bulls sold for $28,500. The top selling bull, WR 4A JAX JACK 855, fetched $3,700. Three yearling heifers sold for $7,800. Top selling heifer was MACKLUX SABRINA 888 and sold for $3,200. One bred heifer sold for $3,500.